Simply incredible. Still gives me chills watching it over a week later. WTH?! (What the Heck?) moments are attempts to find the memorable and the off-beat perspective on Longhorns sports. Here are some interesting moments from the Texas’ game against the Kansas Jayhawks. Pregame WTH DKR Memorial?! On a chilly night with the largest crowd in UT history to watch a football game (101,357) the stadium crew went a little overboard. The customary smoke machine that the team enters the playing field was a little concerning. I was waiting for some of the Horns to run into the goal post upon exiting with way too much smoke bellowing out of the tunnel. 1st Quarter (5:54) WTH Fisher?! I enjoy the enthusiasm from a weatherman, but this is ridiculous. KTBC Scott Fisher opened up his forecast on the Godzillatron with the words “Howdy, howdy, howdy…” Sorry Scott but please know your audience. We play against the Aggies later this week. 2nd Quarter (6:50) WTH Mangino?! KU Jacob Branstetter was told to onside kick by the “Big Man” early on in a close game. This was the wrong message to send to the Jayhawks that they needed this trick play to stay with the Horns. The resulting play was unsuccessful and the Horns took over to extend their lead with a 49 yard field goal by [tag]Hunter Lawrence[/tag] (17-6). 3rd Quarter (8:03) WTH McCoy?! One play. One throw. One awesome touchdown. Great throw by [tag]Colt McCoy[/tag] and an awesome grab by a streaking [tag]Malcolm Williams[/tag] for a 68 yard completion that completely knocked the Jayhawks out of the game. WTH Shout out to Colt McCoy for becoming the winningest quarterback in college football (43 wins). We hope you extend this record by a few more games! 4th Quarter (11:29) WTH UT Kickoff coverage?! OK we have one major concern that popped up in this game. The kickoff coverage was abysmal when KU Dezmon Briscoe ran back the kickoff 98 yards for a touchdown. UT Justin Tucker has the leg but he does not always make it to the end zone. The coverage team is at fault for this return. WTH Shout out to UT redshirt freshman [tag]Jamison Berryhill[/tag] (5-11, 225) who routinely ran down the field to be a wedge buster. Love seeing a player give up his body for his team. WTH Shout Out?! Thanks Longhorn seniors for a tremendous season, especially Colt McCoy and [tag]Jordan Shipley[/tag] for delivering a Big XII South Championship. Next up for the Longhorn’s is the final regular game of the season against the Aggies at 7pm November 26th. Wow, what a game. I must say that after [tag]Oklahoma[/tag] scored so quickly on their first two possessions, I thought we were going to get run out of the Cotton Bowl. Thankfully Jordan Shipley stepped up and Colt McCoy was able to keep the team calm. After that our defense made some big plays and Colt seemed to have full control of the game. My favorite play of the game was easily the Quan Cosby block where he laid out #11. And my least favorite had to be the horrible penalty call when we supposedly “ran into” the punter. That punter has been watching too much soccer because that was some serious flopping. Even though [tag]Colt McCoy[/tag]’s stats don’t really show he had a great game, I felt his leadership and calmness was the key to victory against OU. Colt finished with 28/35 passing, 277 yards, and 1 touchdown. The most important stat Colt put up Saturday was zero turnovers. Colt simply didn’t make any mistakes. Colt definitely put himself into the thick of the Heisman race with this victory, and I think it is about time. Sam Bradford may have had better numbers, but I would take Colt any day. John Chiles actually got some early playing time, probably trying to catch OU off-guard, but it was to no avail. Chiles did absolutely nothing and continues to disappoint. [tag]Chris Ogbonnaya[/tag] got the start again Saturday, and I think he proved why. 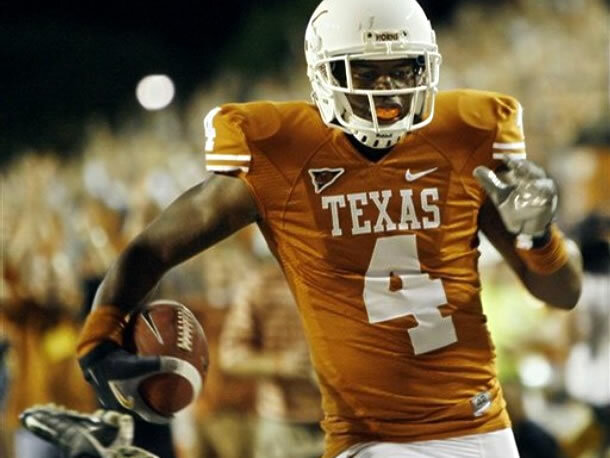 He ended up with 127 yards on only 15 carries, including a long 62 yard run which sealed the game for Texas. And even though [tag]Cody Johnson[/tag] only got 3 carries, he made the most of them scoring touchdowns on each one. He has proved he is a great goal line runner, and he and Ogbonnaya are proving to be a lethal 1-2 punch. In our most important game of the year so far, [tag]Vondrell McGee[/tag] ended up with only 1 carry for -2 yards. I think it is safe to say the coaches know who to give the ball to now. I didn’t think Texas could win this game with only 2 receivers, but the combo of [tag]Jordan Shipley[/tag] and [tag]Quan Cosby[/tag] was just too much for the Oklahoma secondary. Shipley seemed like he was open on every play and made some key first downs. He finished with 11 catches, 112 yards, and 1 touchdown. Cosby was all over the place too adding 9 catches and 122 yards. Cosby may be a little undersized, but he probably has some of the best hands in the Big 12 and always seems to make big plays. The rest of the receivers combined for 4 catches and 16 yards. Even though I think the defense played great, I do have to dock them for allowing 5 passing touchdowns. The greatest part of the defense on Saturday is that I actually noticed our safeties, and in a good way. [tag]Blake Gideon[/tag] seemed to always be around for the tackle, and [tag]Earl Thomas[/tag] ended up with two interceptions. Both young safeties seem to be coming around and I can’t wait to see how much more they can improve before Missouri. And [tag]Roddrick Muckelroy[/tag] was simply ridiculous. He led the team with 16 tackles, 13 of them solo. 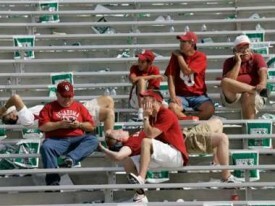 Didn’t you notice every time OU ran the ball they seemed to go nowhere? Yeah, that was “Muck”. [tag]Sergio Kindle[/tag] showed again that he is scary athletic. Kindle flies around the field with reckless abandon, and the combo off him and [tag]Brian Orakpo[/tag] coming off the edges is just too much for most teams to handle. The A mainly comes from Jordan Shipley’s 96 yards kickoff return in the 2nd quarter. Texas was down 14-3 at that point and it looked like it could be a blow-out. I think that play single handedly kept Texas in the game and was the spark to get the team going. [tag]Hunter Lawrence[/tag] added 3 field goals and looks like he is a kicker that we can rely on in tough situations. How can you not be pleased after that game. Even after the referees giving OU a free touchdown, Texas still prevailed. Now Texas faces the pressure of being #1, and the schedule doesn’t get any easier. They only have #11 Missouri, #8 Oklahoma State, @#7 Texas Tech, and @#16 Kansas. And did you realize the Big 12 Conference South Division has 4 teams in the top 8? That has to be a first.